Donna Claytor lives on Cape Cod, Massachusetts with her husband, 2 2 dogs, 2 cats, numerous chickens and fish. 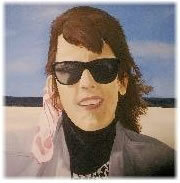 Donna loved painting and drawing at an early age, growing up 90 miles from Chicago. Living as a starving artist in the 1970's she lucked upon a full-time job as a calligrapher at a map company. After traveling to Europe she packed her bags and headed to the windy city where she was employed as a drafter at a Land Surveying Company. Ten years later found her on the East Coast, running a small drafting/graphics department for an Engineering/Surveying company near Washington, D.C. Bored with technical work, Donna then explored various part-time ventures in opening her own art gallery, faux finishing as well as working as a graphic artist. Adopting a small child and buying her grandfather's long-lost house in New Hampshire changed priorities and the Claytors embraced Cape Cod as their new home in 2001. Donna was inspired by a quilting book that uses batik fabrics to create wallhangings (and a lively group of rug "hookers" that "egged" her on). Pulling her own resources and techniques used in "faux" finishes she now designs and creates complex and whimsical paintings. When not dreaming up new designs, Donna enjoys playing with her pets, gardening, traveling, bellydancing, and walking historic New England villages & the beautiful beaches that surround Cape Cod. Recently acquiring a "get-away" in coastal Georgia, Donna now finds new dimensions have been added to her life and work. In the creative spirit, she reserves the right to venture out in any direction from here! The name "Fish House Designs" evolved from the previous owners last name: "Fish." 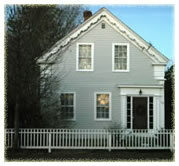 of Donna's 1830's antique house and art studio on Cape Cod. The Fish family lived in the house for almost 100 years. Mary inherited it from her father Nathaniel and lived in the house for her long life of 80 years. They took very good care of it so it is entirely original.